His work is often recognized by his hyper-realist style, by the delicate manner in which he handles the supremely focused photographs of faces. To add to the effect of grandiosity, these paintings are often rendered on an extremely large canvas with all the details zoomed in and exposed to be observed by the viewer. 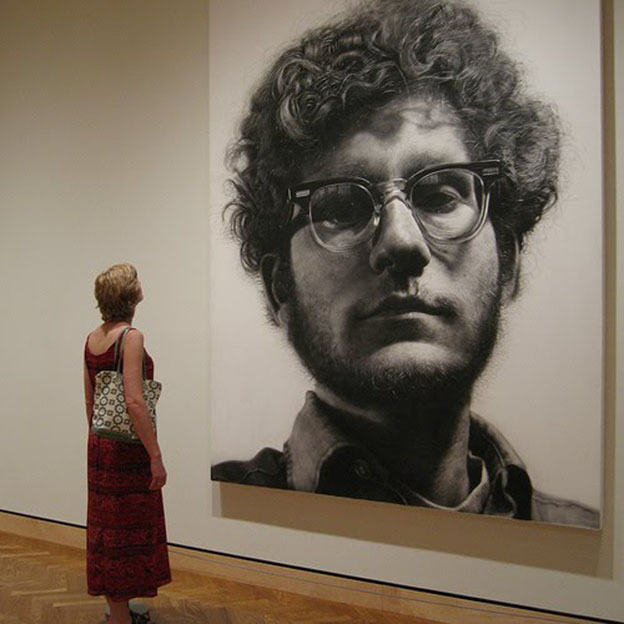 A funny thing I learned today is that Chuck Close is “face blind.” He is afflicted with a condition called Prosopagnosia, which literally means that he has trouble remembering faces. He could have dinner with you tonight and forget your face the next day. 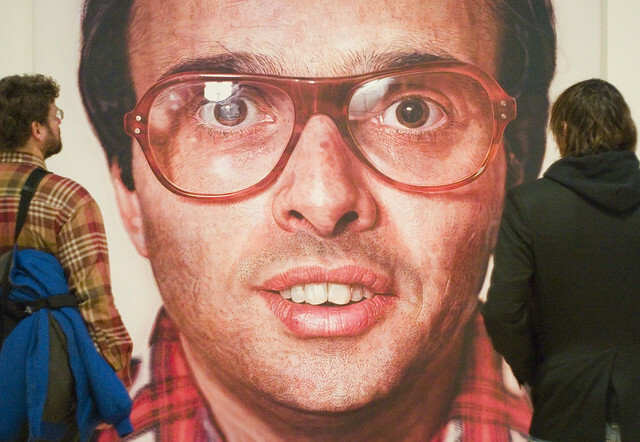 Most of the portraits he has done (and he has done many, in many different ways) are of his friends and family, though this was not a deliberate decision brought about by his Prosopagnosia. 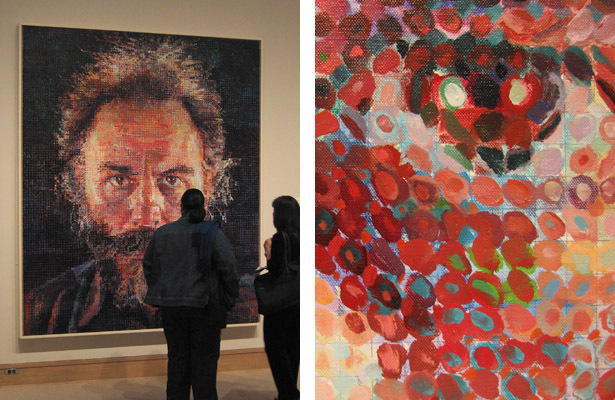 This is one of Close’s most recognizable and celebrated works. Reproductions of this work—which is acrylic on canvas—in books makes it look indiscernible from a photograph because of its great detail. Check out this awesome blog post where Close’s likeness travels from India to Nepal in the form of a postcard. 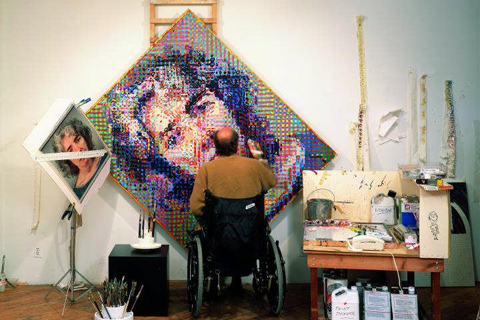 In 1988, Chuck Close suffered a seizure—later diagnosed as spinal artery collapse—that left him paralyzed from the neck down. After rehab, he was able to regain little movement in his arms and legs, but he could no longer walk more than a few steps without the help of a wheelchair. He could also no longer paint his portraits. At least, in the way that he used to be able to. This was created even before he was paralyzed. I think it might be proof that he liked to challenge himself all the time. “As he explained in a 2009 interview with the Cleveland Ohio Plain Dealer, he made a choice in 1967 to make art hard for himself and force a personal artistic breakthrough by abandoning the paintbrush.”* Lucas is the work I’m going to try and recreate today. I had a bad photo day today, but I think we all know that it’s in the details. 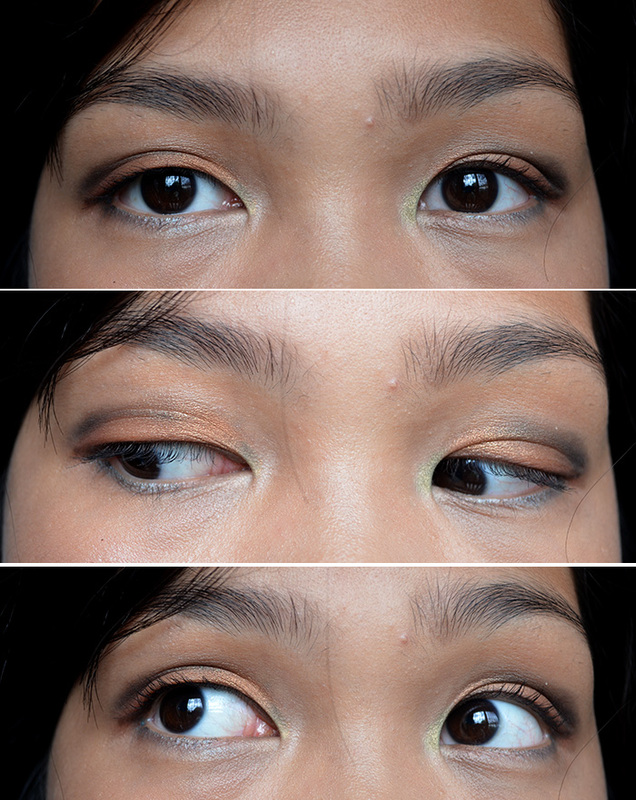 On my neutral, boring looking eyes, I have quite a few colors: a shimmery orange, a burnt rust color, an emerald green, a cyan, some browns, and an apple green. When they converge and are viewed from afar, they meld into a neutral eye. But upon closer inspection, it’s a little but more exciting. — Le Métier de Beauté Mélange de Colour Fashion Palette, which incidentally was back in stock at Saks yesterday. “The advice I like to give young artists, or really anybody who’ll listen to me, is not to wait around for inspiration. Inspiration is for amateurs; the rest of us just show up and get to work. If you wait around for the clouds to part and a bolt of lightning to strike you in the brain, you are not going to make an awful lot of work. All the best ideas come out of the process; they come out of the work itself. Things occur to you. If you’re sitting around trying to dream up a great art idea, you can sit there a long time before anything happens. But if you just get to work, something will occur to you and something else will occur to you and something else that you reject will push you in another direction. Inspiration is absolutely unnecessary and somehow deceptive. 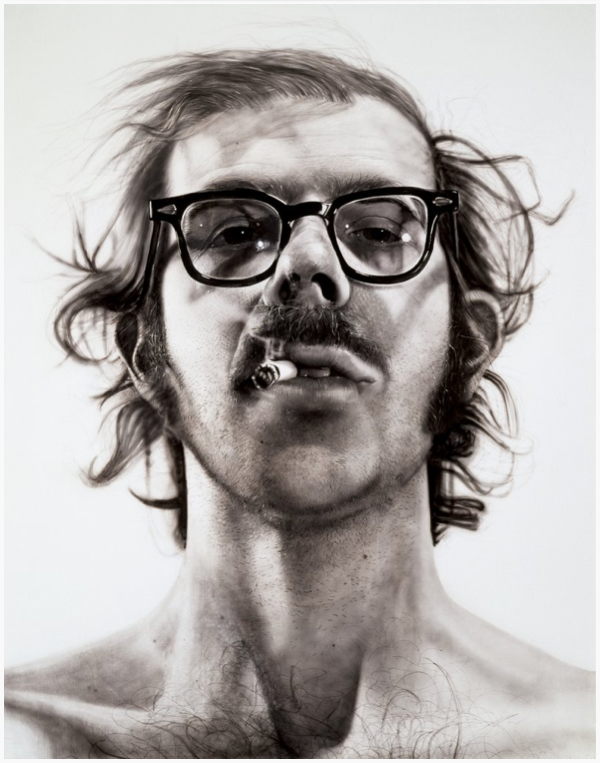 You feel like you need this great idea before you can get down to work, and I find that’s almost never the case.” — Chuck Close, from Inside the Painter’s Studio by Joe Fig. And for more, because he is great. 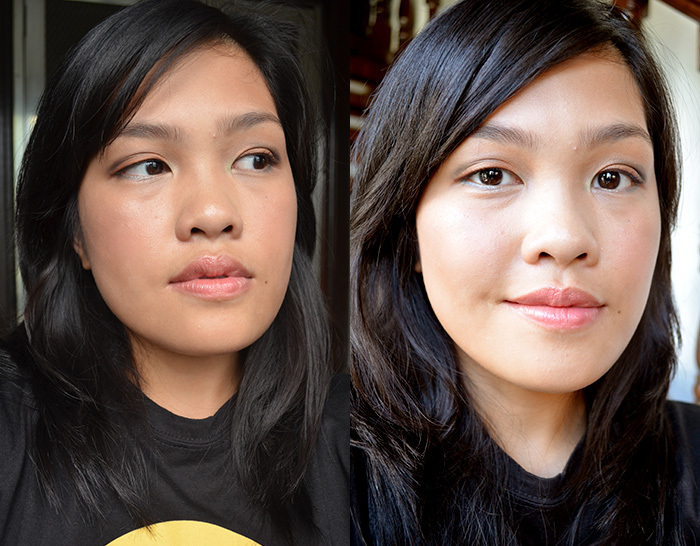 For more Made-Up History, click here. Beautiful post, Carina! I love the art lessons and how you translate the art into beauty. Great post! One of my favorites in this series.